I'd like to say a big thank you and merci to Schnell Donacien and the fantastic Year 4s of Wix Primary School / École de Wix, who I had the pleasure of visiting last week! It was wonderful to meet so many great readers and writers, and to be asked so many interesting and thoughtful questions. It was also very nice to hear how much everyone had been enjoying Varjak Paw and Phoenix. One Year 4 told me he read Phoenix in just 5 days! Given that it's 490 pages long, that's an amazing compliment for a writer to hear! Thank you all again for your wonderful warm welcome. And if anyone at Wix would like to make a comment about the visit or my books, this is the place to do it – I love hearing from readers! It was a pleasure to have you at Wix last Thursday, many thanks for coming to talk to Year 4B. You're unique and talented and without a doubt we all loved studying Varjak Paw. It was inspiring to hear from you to find out how you wrote your books. You're quite a perfectionist! It's astonishing that it took you 7 years to write Phoenix. I'm half way through it and so far... It's AN OUTSTANDING STORY! It's filling my passion about astronomy and space and despite the danger I would love to be Lucky, the hero! How awesome it would be to touch the stars and have super powers! Before reading Varjak Paw I preferred non fiction books. However, Varjak Paw is such an exciting book, it got me interested in fiction stories. Please keep writing fabulous books. Once again, I would like to thank you for your time, your extra ordinary stories and for your autograph. My class and our teacher loved your visit. Thank you so much for your fantastic comment - I think that's one of the best comments I've ever had on this site! It's great to hear how much you enjoyed the visit, and Varjak Paw, and much you're enjoying Phoenix now. I love what you said about astronomy and space. I think it would be amazing to touch the stars! Thanks so much again, and please say hi from me to everyone at Wix! Thank you for coming into our school on Tuesday. We had been looking forward to your visit so it was amazing to finally meet you. I found it very interesting when you told us all about your idea for Varjak Paw originating from your own cat. I enjoyed your visit as it made the day at school more fun. Thank you for coming to our class and sharing your news that it took you 17 drafts to write Varjak Paw, 11 to write the Outlaw Varjak Paw and 7 years for Pheonix! I was surprised to hear that you're first books: Several Planets and Magic Bubbles were not published, so 80 no's and 3 yes's! I read the first book and immediately had to buy the Outlaw Varjak Paw because the first was so good, please write another! We were totally thrilled by your marvellous presence just five days ago! I'm pretty sure everyone ( including me ) was captivated by your life story. I would like to thank you for coming in my class and telling us about you and your books. I enjoyed reading Varjak Paw a lot because it is a creative book , this cat must learn to fight, not quite dead, not quite alive. I also liked the parts of the book when he was dreaming about the Way. Thank you also for responding many of my questions , and signing our books. We were delighted that you came to 4B. to write Varjak Paw,2 years to do the outlaw,and 7 years to do the Phoenix. We really appreciated how you talked and explained about your life and your books. We wanted to say a massive thank you! Hello, I am Paul, in the front left seats in year 4b near my teacher. I want to say " thank you for coming and visiting the class this week." On Tuesday I learned that we can't do something in one go , but we must be patient and never give up , just like you did. Thank you very much for coming to WIX Primary School! Thank you very much for having signed all of your outstanding books! Did you enjoy being with us? We have loved meeting you and listening to your strange story about your childhood! We were astonished that you took 17 drafts to write Varjak Paw! We were very interested about an authors life. We had a lot of fun with you! It was a pleasure that you came to our school, I loved the way you explained your life especially your favourite books and authors like Michael Morpurgo. Every one was looking forward to seeing you. I think Varjak Paw is the best book in the world I will give you 10/10 for this book. You are a fabulous author! . Thank you very much for coming in our class. It must be a long way from your home . I was so happy when you signed Varjak Paw .I think I must write a book when I'm a adult .I think I need to start reading all these books again to realise how to write books like that .To write a book I must have a pet like you. Thank you for your visit to our school. We had the most privileged time of our lives. Thank you for signing our books. I am looking forward to many of your wonderful new books. It's a shame you didn't get any smarties for winning the smarties prize. I will keep the way alive! Thank you for coming into are class, I really enjoyed asking questions and hearing about your really extremely wonderful books and how you wrote them! I also enjoyed listening to how many years and drafts it took you to write Varjak Paw, the Outlaw Varjak Paw and Pheonix. Thank you for signing our books and coming in. I'm really looking forward to the next Varjak Paw and other books. Thank you very much for coming into our class. I loved listening to your stories, they were really captivating. Your cat Varjak Paw is very courageous because he climbed your garden wall for the first time on his own. I hope that for your 3rd Varjak Paw story not too many publishers will say no to you. I hope as well that it will not take too long and will not be too hard to write the story. The end of Varjak Paw was fabulous. I am really looking forward to reading the Outlaw Varjak Paw and the Phoenix. I was really happy to have an author in class. We do not always have authors in our class. Thank you so much for visiting Wix Primary school. It has been a pleasure to see you in our school. 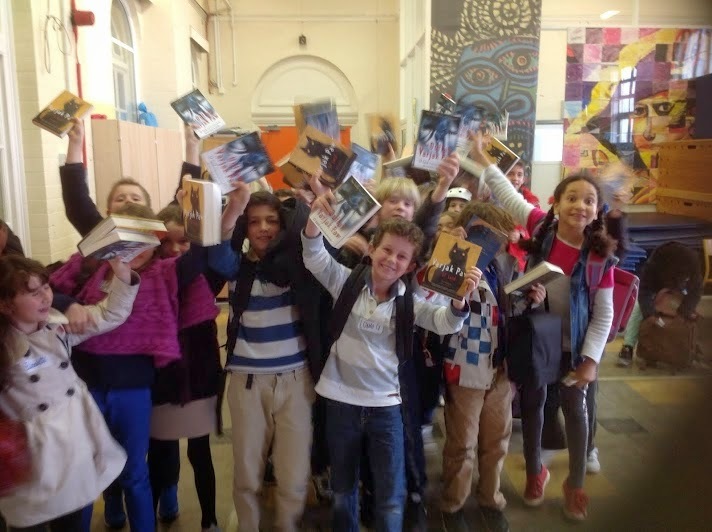 We were all extremely pleased that you signed our amazing books. It has been a pleasure to have you in our class and to share all your fabulous ideas. I was amazed to hear about all your fabulous books and novels.I hope you enjoyed your visit! I was really pleased to hear that you were making new books as good as your other taking novels. When I read the Phoenix my head was full of questions. The amazing adventure was full of excitement. Thank you so much for comment! I loved visiting you and hearing all your questions - it was a great day for me too! Thank you for traveling all the way to Wix on Thursday. I was blown away by your fascinating life and stories. I told all my family your stories with great interest. Thank you so much for your comment - I'm really glad you enjoyed Varjak Paw! I will definitely write another book about Varjak one day, but in the meantime, I hope you'll try Phoenix too - I think it's my best one so far! Thank you so much for that lovely comment! It really means a lot to hear you were inspired by my story. And while it's true that I hated my publisher at that moment, and still hate him from time to time - he does always help me make my books better, so I love him too! Thank you so much for your comment - it was a pleasure to visit, and to hear all your questions and sign your books. Happy reading! You're most welcome - and thank you both! I really enjoyed the visit, and meeting you all. I hope you enjoy reading the books! Thank you for that great comment! I think that's very true - if you want to do something really good, it probably won't happen in one go. But if you're patient and you persevere - you definitely CAN get there in the end! Wow, 10/10 is an amazing score, thank you so much! That really means a lot to me. 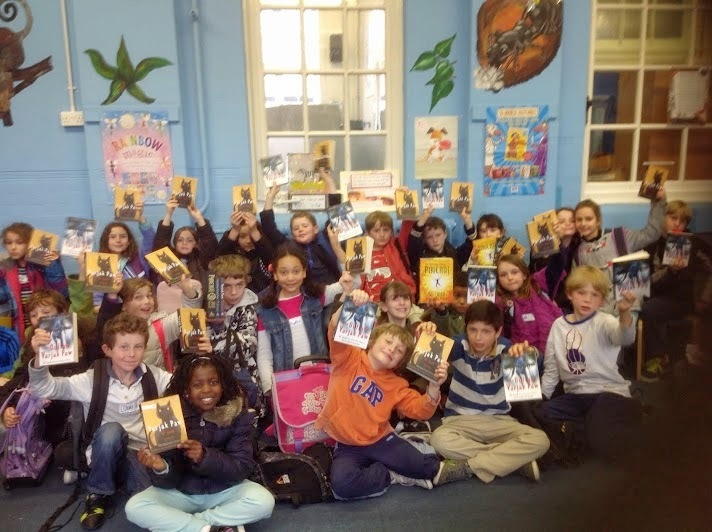 It was a pleasure to visit your school and to meet you all; I hope you'll enjoy my other books too! Thank you so much for your great comment! I think every writer I've met really loves reading, so if you want to write books, the best thing you can do is to read a lot! So good luck with your writing and your reading! Thank you so much for your great comment, it was a privilege to visit you all! It's true that I was disappointed not to be given lots of Smarties, but it was wonderful to win that prize anyway, because it was voted for by readers. I'm glad to hear that you'll keep the Way alive! Thank you so much for your comment, it was great to visit you! It will probably be a while before the next Varjak Paw, but I hope the book I'm working on right now (TYGER) won't take so long. I'm nearly finished with the 3rd draft... I'll make blog posts about it whenever I have any news, so come and have a look at this site every so often to find out what's happening! Thank you very much for the great welcome you gave me - it was a pleasure to visit you all, and to hear all your stories and questions too! And thank you for your kind words - I hope the next book won't take too long as well! Thank you so much for your comment, I really enjoyed visiting Wix! And thank you for your kind words about my books. I'm so glad that you enjoyed Phoenix, and that you felt it had adventure, excitement and mystery, because those are things I really love in books myself! I hope the next book (TYGER) will be even better! Thank you for your comment, it was a pleasure to visit Wix! I really enjoyed meeting you all, and hearing your stories and questions too. I hope you enjoy the books! Thank you so much for your comment, and for the great welcome you gave me when I visited! It was fun to meet you all too, and I really enjoyed hearing your stories and questions. Good luck with everything you do!